2. Clean beets and trim the greens from the bulbs. 3. Slice the beets in half and place on a parchment-lined baking sheet. 4.Clean the shallot similarly, slicing off the two ends of the shallot and removing any papery skin. 5. Slice the shallot into quarters and place alongside beets. Drizzle with olive oil. Sprinkle a bit of sea salt and pepper. 6.Roast in preheated oven for 35-45 minutes, or until the beets are soft and tender when poked with a fork. 7. 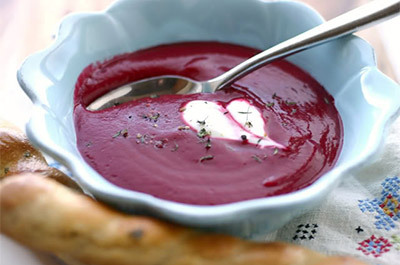 Remove the beets from the oven and allow to cool slightly before scooping the soft flesh from the skin and placing into a blender. 8. Add the roasted shallot, vegetable stock, and fresh thyme. Puree until smooth. 9. Transfer to a small pot, heat until steaming. Salt and pepper to taste. Serve topped with crumbled goat cheese or sour cream. Enjoy!